No matter how old you are or what your social status is, camping is one of those activities that everyone enjoys and actively takes part in. It is a way of bonding with friends and family with a little bit of adventure. Camping is also very rejuvenating as you get a break from your routine life and lets you get in touch with nature. If you are going camping for the first time there are certain essentials that you need to carry. When you are all excited to get going and packing, it is natural that you might forget to keep something. So, we’ve made a checklist of all the necessary things you need to go camping. Being first on the list, this is the most important one in your camping bag. Minor injuries like sprains, small cuts, burns are proofs that you went camping. But it is important for you to take care of them so that they don’t get worse. Remember to check the kit before you leave if you have all the required medicines and that they are not expired, add bandages if you used them the last time. Navigation is essential when hiking or trekking. Your digital GPS might not work when you’re deep in the forest or high up the mountain due to signal issues. In this case, it is good to carry the old school magnetic compass and an updated map. Please make sure that you know how to read and navigate through a map or compass, it doesn’t speak like google maps! When I say, ’weather ready gear’ I am including clothes, shoes, sleeping bags and tents too. These gear needs to be weather appropriate too. If it is going to rain then make sure your tents and sleeping bags and bag is waterproof or if it is going to be extremely cold then remember to take thermals, etc. This is the most essential thing that you need to have while going camping. It has multiple uses such as cutting, self-defence even in first aid. There are many sorts of knives available, out of which Swiss Army Knife is the most common one as it has many types of blades that you can switch for different uses. Water the basis of our survival and we tend to forget about it very easily. So, make sure that you have kept WATER and enough water for everyone to survive for the entire duration. Apart from carrying it you should have or know some alternative sources of water if in case you lose yours or finish it. You can also purify water naturally available in nature because that lake water might just give a bad viral fever. Now this one depends on your camping destinations. For example, there are some very camper friendly places where there will be campsites and fireplaces made already. 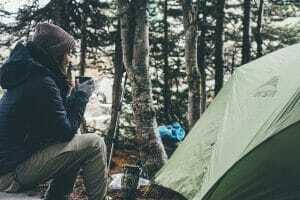 Additionally, there are some national parks meant especially for camping so, they have stores where you can buy or rent camping supplies such as stoves or food supplies from. But if you are going full vogue camping in the Alps or Himalayas food becomes a major problem. Carrying lasting meals or meal preparations that you can cook over an open fire is a good option. Additionally, you should always carry small snacks to keep your energy levels up. If you are a newbie camper or a pro, this list of essentials will make your first trip easy or will serve as a checklist for the 176th one! Happy Camping!